Only Using the Right Tools..
You Can Bask In The Glory Of Free Targeted Traffic To Your Websites IF You Know The Right Tools And How To Use Them! You Can't Build A House With A Butter Knife And A Pair Of Pliers! You Can't Get To The Top Of The Search Engines Without The Right Tools, Either. Let's keep this short, but most definitely sweet. Why you may ask? The answer is that almost every online moneymaking venture has a few things in common. There's a website, a means to make money with the website, and people visiting the website. It's a pretty easy equation to figure out. If you lack any of those three elements, you aren't going to make one thin dime. The first two components are completely within your control. You can build the site of your choice and use it to make money in any number of different ways. Really, that's the easiest part of the whole arrangement. The problem usually centers around that last factor, visitors. Getting good traffic to a website can be a real challenge and its a struggle you must win in order to be successful. You can get traffic in many different ways. You can buy it outright, but that strategy is costly and usually doesn't get you good leads (if it gets you real people at all). You can seduce it to come to your site with advertising. That can be incredibly effective, but it can also have a substantial price tag and an error in judgment can mean a complete wipeout. You can rely on links at other sites. That's a nice way to pick up a person here and there, but it can't deliver the massive influx of visitors you need to make a killing. That leaves one method. Search engines. Why Do You Need Search Engines? It's free. People are voluntarily checking out your site without you paying a dime to anyone for the opportunity. It's targeted. Those visitors are finding your site because they are intentionally looking for the kind of materials, information, products or services you provide. Every visitor is a prequalified lead. It's massive. Millions upon millions of searches every day. Millions of users relying on search engines to find the information they need. It can feel like an infinite supply of traffic! The trick is getting your site up there toward the top of the search results when people are looking for the kinds of things you can offer them. Simply put, search engine traffic means earnings. If you'll able to generate a consistently substantial volume of traffic for your website, then you'll be in business… GOOD business… for a long, long time. It's all about building the right kind of site for maximum search engine appeal. "You can't just toss up a site and assume that Google, Yahoo and MSN are going to fall in love with and reward you with that high-volume visitor stream you want. " You need to build your site the right way. No matter what you're building, it always pays to use the right tools. You can't build a house with a butter knife and a pair of pliers. No matter how resourceful you are, you can't build an operable automobile with a soldering iron and a spatula. Yes, those examples are exaggerations. They hammer the point home, though. You must have the right tools for the job. But for some reason, people overlook that proven morsel of common sense when it comes to building sites that will generate search engine traffic. They put together a site and hope for the best, when they might actually experience the best if they would have brought the right toolbox to the job site. That's why I created "Tools of the Web Trade: Search Engine Tools Explained." traffic. You'll be rewarded with wild profits and earnings. "Tools of the Web Trade" isn't a catalog filled with product recommendations. I'm not sitting here on the other end of this ebook licking my chops and hoping you're going to go out and buy a series of tools in which I have a vested interest. It's an examination of several popular search engine tools and it provides an honest, balanced assessment of all of them. It then goes beyond that! It also covers more than a few tools that are still floating around out there that you don't want to use. Written in a straightforward, conversational manner. It's not an academic tome you'll have to spend months deciphering. It's easy-to-read and makes its points clearly. Constructed to give you more than the rudimentary basics about each tool. Many people fail to use the right equipment because they don't understand why it works or why they might need it. "Tools of the Web Trade" provides that information. Designed to provide you with a broad perspective on the tools associated with building search engine-friendly sites. It covers multiple tools and doesn't focus exclusively on one aspect of the overall puzzle. "Tools of the Web Trade" is over fifty pages of rock-solid information about the things you can do and use to attract a wide and rushing river of visitors from the search engines--without paying them for all of those hot, prequalified leads. This isn't a little ten-page "report" that leaves you with more questions than answers. When you're done reading "Tools of the Web Trade," you're going to have your own personal toolbox filled with the things you need to build a search engine friendly site. Plus, you're going to know how to use them and why they work. That's because this guide doesn't just tell you "this is what the tool does." It also tells you whether it works, why and when you might want to use it, and supplies you with the kind of background information that ties it all together so that you can make sense of the whole process. "Let's think about what would happen if you used the right tools to build a search engine-friendly site." You would be able to spend less time spinning your wheels on search engine optimization strategies that don't do a thing. You would be able to save, spend or reinvest money you would otherwise have to pay out in advertising. Remember, search engine traffic is free traffic. You would be able to post bigger sales numbers or profits than ever before with your huge newfound customer base. That's why "Tools of the Web Trade" is here. To allow you to do those things. It's a great guide to finding and using the right tools to get to the top of the search engines. Take a look at just a small sampling of the topics covered in "Tools of the Web Trade"
And that's just a few of the things in the top drawer of the search engine toolbox. "Tools of the Web Trade" provides much, much more. It's an easy-to-read, straightforward guide to many of the top tools available to help you develop a loving and rewarding relationship with the search engines. They'll love your site so much that they'll send you that much-coveted traffic. You'll be rewarded with increased earnings. This resource is, without a doubt, the most thorough and intricate tome of traffic-generating information available on the World Wide Web. Designed for novice, intermediate, and veteran marketers alike, Tools of the Web Trade is an eBook that will accomplish what its title promises… explaining web traffic in the simplest, most accessible way possible. delineates all the things you need to know about traffic, as well as all the strategies you have to master to be able to provide for your online business the great number of visitors that it needs. Consider the following features that can be found in "Tools of the Web Trade". A Step-By-Step introduction to the idea of traffic, its value to your business, as well as more then the general concepts. Filled with FREE options, including assessment of why and when you might want to use it! This alone is worth triple the package, as your time is money and searching for these freebies can sap you of your valuable time! Tips to Save you from time wasting spam emails that are being used by some marketers.. This book tells you how some tools many fill your email box with unwanted spam! Tons of "common sense" basic that reveal and demystified to give you a better picture of how easy it really is to get the tools you will need that will catapult your business to the next level of online prominence! By the end of the eBook, you will have learned all that is needed to be able to compete with the best of them. You will be fully equipped with the knowledge that will secure for your business a consistent influx of visitors and sustainable profits for many, many, MANY years to come. Tools of the Web Trade is more than just an eBook. It is an investment with a projected lifespan of close to a decade. The things you will learn, and the things you will employ, will plant the seeds of online fulfillment that will serve your business nonstop for the coming years. And as with our previous example, if the Internet marketing landscape were a kitchen, then Tools of the Web Trade is the only cookbook you will ever need to come up with mouthwatering dishes that you will enjoy for a long, long time. If you're ready to make the investment of a lifetime, click on the order button now, dear friend, and experience for yourself a surge in traffic beyond your imagination. "Tools of the Web Trade" is your opportunity to understand the search engine optimization process and how you can finally start getting your fair share of that Google traffic. 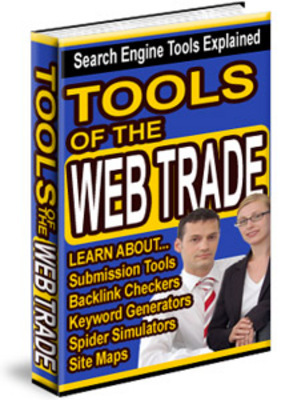 Tools of the Web Trade backlinks;sitemap;submission tools 115180638 21.00 best-books Fresh Download Available!